Learning to ski is hard, and teaching a newbie can prove just as difficult. Airhead has formulated an inflatable and ski hybrid that allows beginners to learn to ski with lower stakes. With the inflatable component, the skier won’t be dragged through the water, or struggle to pop up, and other trials that plague the grueling hours of a new skier’s attempts to stand up. 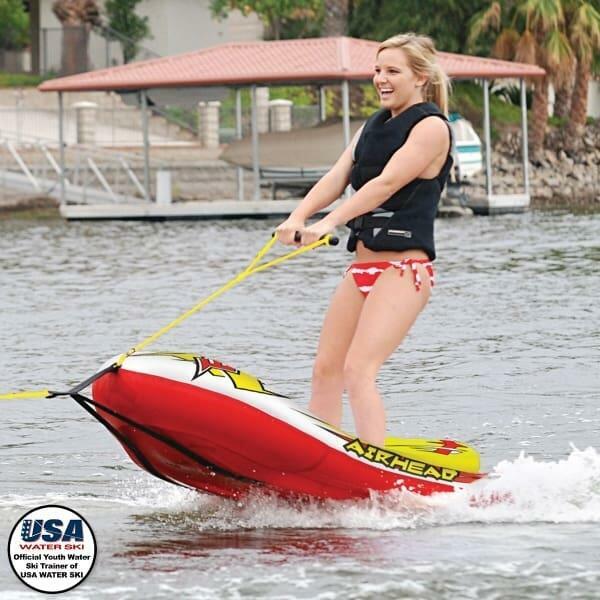 The Big EZ Ski design is so uncomplicated and proven that it is now the official youth training tool of USA water ski. You’ll enjoy the sigh of relief that comes from all involved in a training a newbie: the beginner, the spotter, and the driver. Relax, water sports are supposed to be fun! The Big EZ Ski is one in a pair of two EZ Ski versions. The Big EZ Ski is the larger of the two, suiting one skier weighing up to 120 pounds.